Today starts a new round of ABC Wednesday. I thought I'd try and show coffee shops and restaurants around town during this round. Today we start with Actual Cafe on San Pablo Avenue and Alcatraz Avenue. 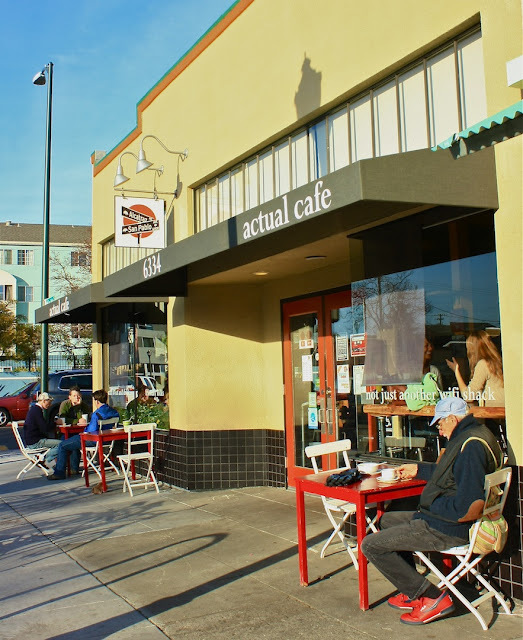 Actual Cafe has been a positive force in this transitional neighborhood ever since it opened in 2009. It offers free wifi, places to park bicycles indoors, and frequent artist events; it serves as a magnet for those who live in the area. The cafe is also a voice for the parklet movement that's gaining hold in the Bay Area. All in all a comfortable place to visit and stay a while. For more takes on "A", please visit ABC Wednesday. Cool! I'm sure it would be very comfy having coffee there as you can hang your bicycle inside.Nice shot! how did it get it's name? Actual as verses Cyber? This looks like a great place to sit and watch for a while. Wow! There ACTUALLY is an Actual Cafe! Great way to kick off the series! Bikes indoors - I'm there (when I'm in Oakland). Great name too. Looks like a friendly place! For the uninitiated, what is a parklet place? Sounds great. Bikes, coffee, wifi, local advocate. Got checkmarks on all fronts. As opposed to Virtual Cafe? nice spacious cafe :) My "A" for ABC Wednesday. The name is inviting, how about the coffee !!! ... should be, as there seems to be quite a crowd !